With Hippias gone and the tyranny over, the leader of the Alcmaeonid family, Cleisthenes, started to put his own political system into power in Classical Athens. Cleisthenes wanted power for himself, but he didn’t want another tyranny. Instead, Cleisthenes wanted the ordinary men (though not women) of Athens to feel that this was their government. They should change things they didn’t like by voting instead of by fighting wars. He decided to create a democracy in Athens – the first democracy anywhere. Cleisthenes (KLY-sthen-eez) even had to make up the word! How did Athenian democracy work? There were four main pieces of the government under Athenian democracy. For the most important decisions, you got all the free adult men together in the Assembly to vote. More often, the Boule, or Council of Five Hundred, met as the representatives of the Assembly. Lawsuits were heard by juries of about five hundred men, too. But when something had to be done quickly, that was the job of the ten elected strategoi, or generals. In the Athenian democracy, ordinary men could make all the most important decisions, like whether to go to war. 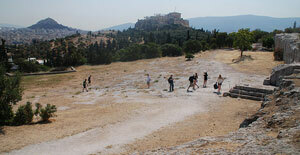 They just went to meetings of the Assembly (Greek Ekklesia), on a hill in Athens called the Pnyx. (Slaves, women, children, and foreigners could not go, though.) You had to have 6000 men at a meeting of the Ekklesia (ek-LAYZ-ee-ah) before they could decide anything. The Assembly met about once a month, unless there was some sort of emergency. The Athenians also chose five hundred men every year through a lottery to be in the Council of Five Hundred, or Boule. Really, Athenian democracy used a lottery? Yes! That’s different from us! We don’t choose our representatives using a lottery! What do you think of it? The Athenians felt that the lottery left the choice of representatives in the hands of the gods, and the gods could make better decisions than men could. The Boule met more often and decided things that weren’t as important. The Boule (boo-LAY) suggested new laws to the Assembly. They made sure the laws were being enforced. And they took care of things like street repair, fixing public stoas and temples, and building ships for the Athenian navy. The Athenians also had some officials who took care of specific things. They used a lottery to choose nine men called archons (AR-kons). In the time of Cleisthenes and later, archons mostly took care of religious things like organizing public sacrifices. The Assembly also elected ten strategoi (generals). They often elected the same strategoi (STRAT-eh-goy) year after year. At first the strategoi just commanded the Athenian army and navy. But by the time of the Peloponnesian War the strategoi were basically running the government, like the United States President. 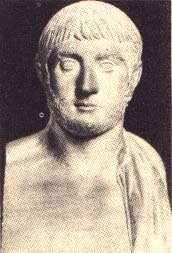 Pericles is the most famous strategos. Pericles had this Odeon – small, covered theater – built on one side of the Acropolis. It’s one place where Athenian juries may have met. Others include Themistocles and Alcibiades. The fourth part of Athenian democratic government was the justice system – the judges and courts. Men volunteered to be on juries (women couldn’t serve on Athenian juries). This is one of the bronze tokens (a pinakion) that Athenian men got when they volunteered for jury duty. The Athenian courts took six thousand volunteers every year, which was most of the people who could vote in Athens. Each volunteer got a bronze label (a pinakion) with their name on it, and the name of their Athenian tribe. Then for each day when the court was in session, the Athenian government picked about five hundred men to be on that day’s jury and hear cases. For more serious cases, they might pick more men. This is a lottery machine for choosing Athenian juries – a kleroterion. You put your token into one of the slots. Just like with the Council of 500, the Athenians used a lottery to choose the jurors for each day. 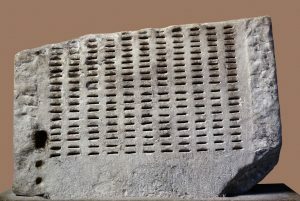 To draw the names fairly, and to keep people from bribing the jurors, they used a stone with slots carved into it (a kleroterion). Each volunteer put their token into a slot. Officials dropped black and white marbles into a hole in the side of the kleroterion, and they fell out the bottom. (You can see the hole on the left side). If a white ball came out, your row of volunteers were on the jury, but if a black ball came out, you were not. Once you were on the jury, you got two brass tokens that looked exactly the same. But they weren’t the same! One token was solid brass – very heavy! The other token was hollow and light. Then you all took your seats and listened to the arguments from each side. These were the tokens Athenians used to vote: there’s solid ones on the left and hollow ones on the right. The jury decided cases by a simple majority – whichever side got more votes won. You voted by dropping one of your brass tokens into a container. Nobody could tell which way you had voted. Defendants could not appeal the jury’s decision. If the jury convicted you, then they would hold another vote to decide on a sentence, as in the trial of Socrates. Athenian juries decided criminal and property cases. They also decided whether laws passed by the Assembly were legal or not, like our Supreme Court. Cite this page: Carr, K.E. 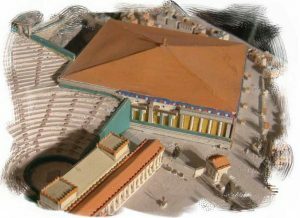 Athenian Democracy – Cleisthenes and Pericles. Quatr.us Study Guides, July 6, 2017. Web. April 25, 2019.